You are here: HomenextPeoplenextPlayer ProfilesnextHalford, Jonathan George "Biddy"
Jonathan George Halford was born in Gloucester in 1886, the son of a blacksmith’s striker. Biddy initially followed his father into this line of work, but soon signed up with the Gloucestershire Regiment of the Regular Army on 18 February 1903 as Private 6748. George had previously been a part-time volunteer militia soldier, Private 7481, of the 3rd Militia Battalion, Gloucestershire Regiment. He was passed as ‘fit’ at his medical examination in Bristol which described him as 5 feet 7½ inches tall, weighing 120 pounds (8 stone 8lbs), of fair complexion with brown eyes and light brown hair. He left the army and went onto the Active Reserve on 28 February 1905. During his time in the Army he was a 3rd Class Certificate of Education (May 1903) and passed the Ambulance Course (December 1903). By 1906, Biddy had returned to Gloucester and married Martha Jane Dix, who worked in a local jam factory. Back in civilian life, he resumed work as a blacksmith’s striker, and joined the City Club to play rugby football. He first appeared for the City in the 1907-8 season, thus starting a playing career which was to last eleven and a half years, and during which he became a formidable second row who went to the top in rugby terms and rates as one of the best to play for Gloucester. In the early years of his rugby career WB consistently reported Biddy’s surname as “Holford”, but Army records and most census records are “Halford”, and after WW1 rugby reporting normally uses this form, so this is the spelling adopted throughout this profile. Biddy came into a side captained by Gordon Vears, and played his first game for Gloucester on 7th December 1907, when Stephens and “Whacker” Smith ran in tries to defeat Exeter 6-0 at Kingsholm. He quickly became a regular fixture in the side, racking up 16 appearances before the end of the season. He scored his first try for the Club on 17th April 1908, and it proved decisive in a 16-14 home win against London Welsh. In 1908-09, Biddy played in all but two of Gloucester’s 37 fixtures under the captaincy of Arthur Hudson, scoring 5 tries – impressive for a second row. His first of the season contributed to a 9-7 win at Cinderford, in what was described as “a hot game!” WB reported his arrival in the team as “three splendid forwards were discovered in Griffiths, Halford and Wyburn – young, speedy, clever, and good workers”. He kicked off 1909-10 with a try in the first match of the season, an 11-6 win in “a really good game” against Penarth, and followed up with further tries against Clifton, Cheltenham and Pontypool in the course of 32 appearances out of 37 matches played by the Club. During this season, Halford won his first county cap, with a fiery baptism at Redruth on 3rd February 1910. Cornwall had beaten Gloucestershire 11-0 in their SW Group match earlier in the season, but slipped up elsewhere, so a replay was required. Biddy made an early mark for the County, scoring a try, which proved important in a narrow 12-11 victory. He remained in the team for the semi-final at Blackheath, when Gloucestershire again squeezed home narrowly by 6-3. It was back to Kingsholm for the Final against Yorkshire, and Biddy was one of seven Gloucester players who played their part in a glorious triumph, 23-0. This brought the County Championship to Gloucestershire for the first time. Biddy again started the season with a bang in 1910-11, scoring a try in the first match, a 30-5 win over Bream, and another soon followed in a 52-0 defeat of Clifton. These were the first of 9 tries for the Club in 34 appearances out of 40 matches played. He scored Gloucester’s only points with a try in a defeat at Pontypool; it was perhaps no surprise that it was a second row who scored on what was described as “a shocking ground”. Further tries followed against Cinderford and Bristol, before Gloucester travelled to Toulouse where a famous victory was won 18-13 on 28th February 1911 against Stade Toulousain, including a Halford try. He won another 4 county caps, playing in all of Gloucestershire’s games, and scoring a try against Somerset in a 12-11 win at Bristol, but the county failed to progress beyond the SW Group stages, slipping up 13-17 at Kingsholm against Cornwall. WB summarised his performances that season as having “worthily sustained his reputation”. There were a further 27 appearances for Gloucester out of 40 matches played in the 1911-12 season. Halford scored only a solitary try, but it was an important one in a hard-fought 8-3 win over Llanelly. This season also brought him a further 5 caps for Gloucestershire, and WB reported that “Halford was strongly fancied for high honours this season, but though getting a place in one of the English trials he had not sufficient backing to go further”. Biddy was appointed Vice-Captain under Arthur Hudson for the 1912-13 season, but was injured in a pre-season trial game, and so his season started late. Nevertheless he made a further 28 appearances for the Club out of 39 matches played, and scored 3 tries. WB said that “he played consistently and well once he commenced seriously, and led the pack with good judgement”. On 22nd March 1913, Gloucester played Bristol at Kingsholm, and Biddy kicked off at the start of the game – he presumably took on this responsibility as captain, but it was a somewhat unusual role for a second row. Gloucester scored 3 tries in the first half-hour, but a tremendous storm then hit Kingsholm, and caused the referee to abandon the game. Following his early season injury, Biddy was unable to force his way back into the County team, and was not selected for a single game as they proceeded to win the County Championship for a second time in his absence (beating Cumberland 14-3 in the final at Carlisle). Halford’s appointment to succeed Hudson as Club Captain for the 1913-14 season. He was rated as “a fine leader”, and led the team to a season’s record of Played 37, Won 25, Lost 10, Drawn 2; Points For 357, Against 167. He appeared in 29 games himself and scoring tries against Cheltenham, Northampton and Cinderford. There were many fine performances during the season, including wins against Swansea 9-0, Bristol 9-0 and 5-0, Cardiff 6-4, Oxford University 9-6, Llanelly 11-0, and Pontypool 8-0. But perhaps the one which was savoured most was against Harlequins at Twickenham. Biddy’s fine performances were also rewarded by selection for an international trial, playing for England v South, but just as his form was reaching a peak, and after he had been re-elected as Gloucester Captain for the 1914-15 season, World War 1 intervened, and his rugby career was put on hold. In the Great War, Halford was mobilised on 5 August 1914, re-joined the Colours as Private, 6748 and landed at Le Havre with the 1st Battalion, Gloucestershire Regiment on 13 August 1914. In January 1915 he sustained a shrapnel wound and was discharged from the army on 17 February 1916 having served for thirteen years. He was thirteen stone when he was discharged. His character was described as ‘good’ although his discharge documents indicate that in 1914 he had been given 48 hours Field Punishment No.2 on three occasions for being late on parade, insubordination and for drinking from a water bottle without permission. Gloucester matches resumed at Kingsholm in the 1919-20 season, and Halford continued as captain, now leading a very different team after an interval of 5 seasons away from Kingsholm during which the war had taken a terrible toll in casualties amongst the pre-war team. There were many new faces, not least Tom Voyce, amongst a few experienced players. In those days the captain bore a lot of responsibility for the team, not only leading them on the field, but also acting as coach. Biddy made a good job of welding together the old hands and the new recruits, and the season record was Played 33, Won 19, Lost 12, Drawn 2; Points For 384 Against 222 . Biddy himself was able to play in only 18 matches, largely because he was frequently required for representative matches. He played in three international trials, which led to his two England caps – his first won against Wales at Swansea on 17th January 1920, when he packed down behind Sid Smart. Despite Wales winning 19-5, and England making 6 changes for the next international, Halford retained his place in the team which won 8-3 against France at Twickenham on 31st January 1920. Between these two matches, on 24th January, Biddy played a hard-fought game for the County against Somerset, which was won 7-5, and during which “Halford, by example and encouragement, led his men splendidly”. Gloucestershire and Biddy progressed to the CountyChampionship semi-final, in which they defeated East Midlands 16-11, and thus to the final when Yorkshire were defeated at Bradford. In 1920-21, Biddy made way for Fred Webb as Captain of the Club, but continued to play regularly, appearing in 31 of the 37 matches played, and scoring 3 tries in the space of 4 matches against United Services, Cheltenham and Cardiff. He also played in every County game – Gloucestershire easily beat Devon and Somerset, including a try by Biddy, and then squeaked through against Cornwall at Camborne, with a last gasp try securing victory 9-6. The semi-final and final were both played at Kingsholm with 9 Gloucester players, including Biddy, in the County side: Surrey were defeated 21-3, and then Leicestershire 31-4 as Gloucestershire retained their tile as County Champions in front of 10,701 delirious supporters. In 1921-22, Biddy had a more interrupted season, playing in 24 of the 41 matches played under Sid Smart’s leadership, and scoring 3 tries against Harlequins (won 6-0 – “a splendid game; the Glo’ster forwards settled the issue”, Cardiff and Cross Keys. Biddy again played throughout the Gloucestershire campaign, winning a further 6 County Caps, and captaining the side when they defeated Cornwall 34-3 at Kingsholm. In the semi-final, Biddy was one of ten Gloucester players who fought out an 8-8 draw with Surrey at Richmond, and then won the replay 30-0 at Kingsholm in what was described as “a brilliant display”. The final was played away at Villa Park, Birmingham against North Midlands. Biddy again captained the side, which contained nine Gloucester players, and won 19-0 to complete a hat-trick of County Championships. 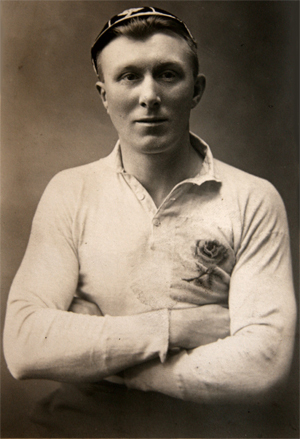 On 3rd December 1921, Biddy played alongside Tom Voyce for England in the trial match against the North, which was won 44-13, but Biddy was not retained for the next trial, and that proved to be his last chance of adding to his two international caps. In 1922-23, Biddy played in 33 out of 43 matches, and scored his almost traditional try at Cheltenham, a match also notable for him kicking two conversions in the 21-3 win. He did not play in the first two county games, but reappeared for the game against Cornwall at Camborne, which was lost 7-9, and Gloucestershire were thus eliminated from the competition for the first time in four years. On 27th October 1923, Biddy played for Gloucestershire at Torquay and they won 12-8; Biddy was retained for the next match at Bristol on 23rd November, which was lost 3-9, and that proved to be his last appearance for the County. He had won 34 CountyCaps, and played in 4 County Championship Finals, all of them won. 1922-23 was also to be Biddy’s last season for Gloucester – he made 10 appearances in the first half of the season, and played his last game against Abertillery at Kingsholm on 22nd December 1923. He finished with a record of 320 appearances and 32 tries. But as was said at the time “a bare record of statistics cannot do justice to Holford’s valued services to the Gloucester Club, but most of us know his worth as a player”. Biddy Halford went on to become a Gloucester selector and committee man, and died in Gloucester in 1960. My father Ray (young Biddy) was Biddy’s eldest son. Biddy lived with them and died in Dursley. He was buried in Stroud. I have one Cap on loan to Gordon League. Also a gold medal awarded for winning the county championship. He was made redundant at the Wagon Works but through the influence of the Club Chairman or President was taken on by the Bristol Bus Co. and eventually became an Inspector. Biddy is my Great uncle, who was my grandmother’s brother. She used to go & watch him play rugby at Kingsholm. This is my great grandfather. I’m so happy to see his photo. His eldest son is my grandfather, his only son is my Dad and I’m his only child. I have one of his England caps, although there was a big family split between him and my grandfather. Supposedly he was a little to quick to his fists and my grandfather left.